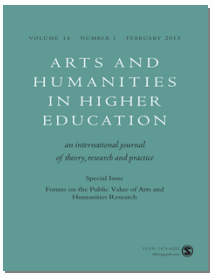 Free access for 10 days to Arts and Humanities in Higher Education: an international journal of theory, research and practice to download all articles in the issue, including “Making an impact: New directions for arts and humanities research” by HEPRU’s Ellen Hazelkorn. Also features articles by HERAVALUE colleagues Paul Benneworth, Magnus Gulbrandsen, and Siri Aanstad. Follow the journal on Twitter here: @AHHEresearch. This entry was posted in Uncategorized on January 22, 2015 by Andrew Gibson.